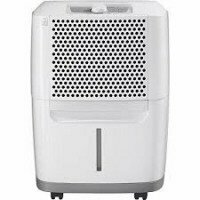 The Frigidaire FAD301NWD 30 Pint Dehumidifier has now been replaced by the FFAD3033R1 but is still available from a number of retailers and will remain so for as long as stocks last. It is a low capacity appliance best suited to smaller rooms within your home or for use in a trailer or RV. It is a compact unit popular for use in bedrooms and laundry rooms. The FAD301NWD is rarely used in a basement as its lower power restricts it to areas of 400 square feet or less. The FAD301NWD is Energy Star® qualified which, under the requirements for certification, means that is every bit as energy efficient as larger capacity dehumidifiers. The appliance works best at temperatures no lower than 60°F and is very suitable for living areas of the home. Reviews by users are less plentiful than for higher capacity models but there are sufficient to show that the compact Frigidaire FAD301NWD is liked by the vast majority of users and well worthy of your consideration if a small dehumidifier meets your needs. Adjustable Humidistat - This feature is the key control on the appliance. With it you select the level of relative humidity you want the unit to reach and maintain. Once set you can leave the dehumidifier to do the rest. 2 Speed Fan - This model has two fan speeds. The higher speed gives faster drying the lower speed reduces the noise from the unit. In a bedroom you will probably prefer the lower speed while in a laundry room the higher speed would usually be selected. Automatic Defrost - This is an important feature but one you can forget about. When the dehumidifier is operating it cools a metal coil and it is on this coil that water vapor condenses. Because the coil is cold ice can and will form on it. Auto-defrost simply stops the unit from cooling the coil so that the flow of air from the fan can melt the ice. This protects the appliance and ensures it works at full effectiveness. Auto Restart - If you should suffer from a power outage this feature ensures that when the power comes on the dehumidifier restarts at the settings you programmed in earlier. Continuous Drainage Option - There is an outlet in the dehumidifier to which you may attach a length of hose to allow the unit to drain the condensate to an adjacent drain. The drainage outlet must be at floor level as this is a gravity feed only. Full Tank Indicator - If you are using the bucket you will be prompted to empty it when it is nearly full by an indicator on the appliance. If you are not close to the dehumidifier there is no need to worry as the Automatic Shutoff feature stops the unit to prevent water seepage. Washable Filter - The air filter protects the appliance and becomes clogged with dust particles over time. It is essential to clean the filter regularly and to make this easier the filter is washable. Portability - The FAD301NWD is fairly light at 31 pounds and may be easily carried or moved on its caster wheels. Sales of 30 pint dehumidifiers are lower than those for larger capacity units and the Frigidaire FAD301NWD 30 pint dehumidifier is no exception. As a well established model, however, there are sufficient user reviews to draw some conclusions with confidence. There are almost no negative reviews for this model and the vast majority of users report high satisfaction with this appliance. Users find it effective and easy to use and some report favorably on the low level of noise from this appliance. The Frigidaire FAD301NWD 30 Pint Dehumidifier is an effective and competitively priced appliance. For use in the living areas of your home it is one of the best lower capacity models on the market. We consider the Frigidaire FAD301NWD highly suitable for smaller areas of the home, stationary or mobile trailers and RV's and are pleased to recommend it to our visitors.